I'm blogging with only a few minutes to spare today, so I will make it short and sweet. This quilt top was made by my sister at least a year ago. She was making it for a dear friend of hers and then changed her mind completely, going with a different design/color scheme all together. I rescued her finished top from the giveaway pile! 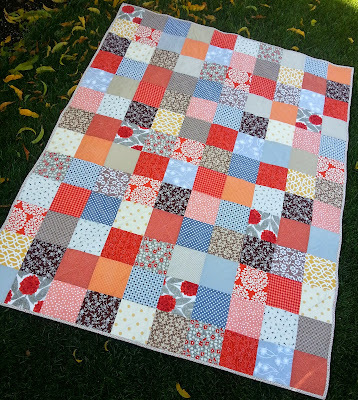 This past weekend, in a fit of creative recklessness, I basted it, quilted it, and bound it up! Quite unusual for me as I'm usually such a slow finisher. 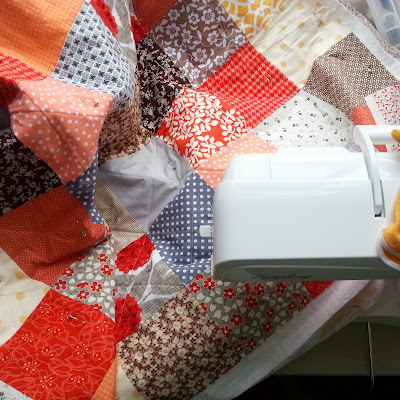 While still in a furry of creative craziness I decided to quilt it myself. Nothing too fancy, just an easy cross-hatch simple straight line design. I chose not to mark my lines, just used the corners as my reference points, so I'm sure there are some parts that are not completely straight. But my new motto is, "If you don't notice it from a galloping horse, then it's fine!" You can see that it has great texture, though. I also decided that I needed more practice on machine binding. I normally hand-stitch my bindings, but was trying to get this one finished super fast, so I chose to do a zig-zag stitched binding. While I think it turned out pretty well, I still much prefer a hand sewn binding when time permits. 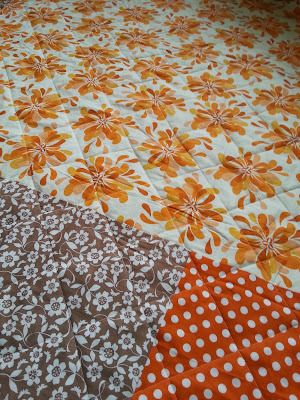 Now that it's finished I'm sending it off to Margarets' s Hope Chest. I'm hoping they can put it good use. It's generously sized at 54" by 70". 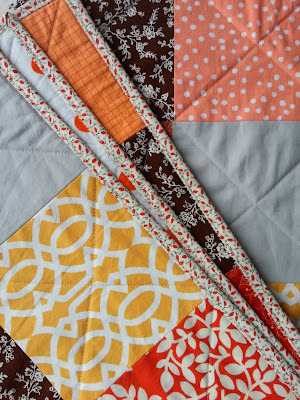 Today I'm off to enjoy the beautiful fall weather we are having, and hang out with the lovely ladies in my quilt club. I've got some good "show and tell" for them. I'll show you all next week what I've been up to. Squares were cut at 6". 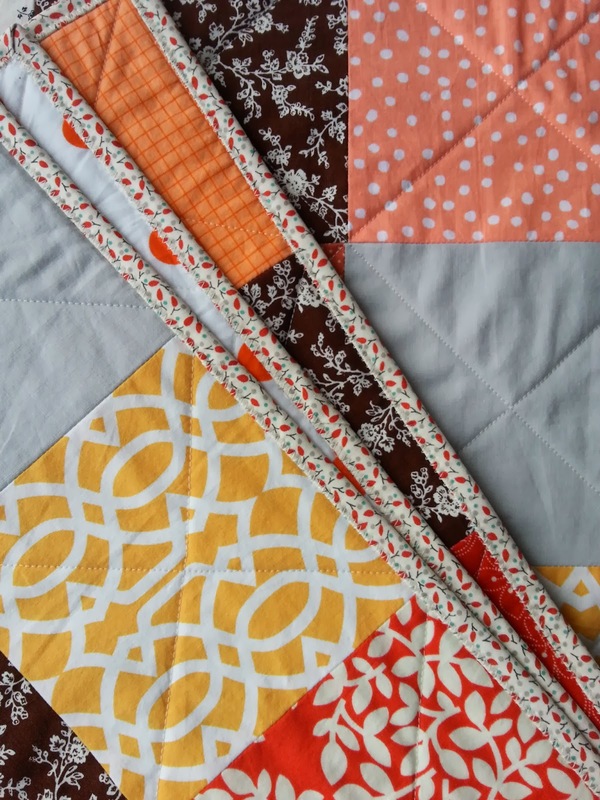 Fabrics are a mix of creams, oranges, browns, and gray prints. Linking up to Fabric Tuesday and Show and Tell Tuesday. I like it! Glad you rescued it and are sending it to a good cause. Someone will enjoy it! Great motto! That needs to be done up in embroidery. Your motto is fabulous. It looks great to me. My Grandmother's motto was 'Walk fast, keep a smile of your face, and no one will notice' - similar to your horse motto! I like the idea of a fit of creative recklessness too!! Love your motto! and Bess's grandmother's too! My new favorite motto is, "If people wanted it to look perfect, then they could have made it themselves!" Beautiful quilt! It will be loved well by someone! I totally laughed out loud when I read your new motto! Sounds like my dad's, "If you can step across it you can caulk it!" 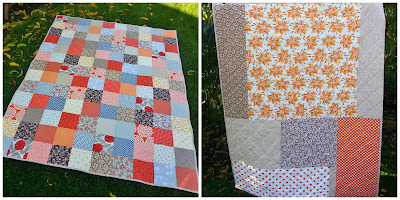 Love the colors in your quilt!